Antonsson is DLF on attack duty, he didn't get involved enough as AF. And not good enough for CF. Has Calvin Phillips developed well for anyone? He has been impressive when he's played but as per my coaching team his potential doesn't seem to be too high. Compared to Vieira for example. See his post of 23rd November at page 2. And, no. The Information is clarification of work permit rules. back up player for me in season 2, but hasn't made the 18 man squad yet. Trying to send him on loan. GK Cristian Bonilla (£300K), Atletico Nacional. DR Madson (£1.6M), VDG, Yarouba Cissako (free). DL Cristian Ramirez (£1.2M) , Ferencvaros. DC Luan (£4.5M), VDG, Israel Puerto (free). DMC Mohammed Sissoko (£30K) Pune, Edwin Valencia (£80k) SAN, Diego Poyet (free). MC Andres Roa (£650K), Deportivo Cali, Jefferson Orejuela (£400K), Independiente del Valle, Carlos Soler (£600K compensation), Valencia, Sinan Keskin (free). AMR Javier Charcopa, (£350K), Emelec, Feiz Shamsin (free). AML Angel Mena (£575K), Emelec. ST Harold Preciado (£2M), Deportivo Cali, Lucas Cavallini (£210K), Fenix. There is great value to be had in Colombia and Ecuador and I've just scratched the surface of the quality players available there. Colombia in particular is a 'gem mine'. Meanwhile Roa and Mena in particular are top players. I'm tracking a number of further players, who will get w/ps, but are not interested in signing for Leeds just now. The fees for Madson, Ramirez, Luan and Preciado included some 48 month payments. Thanks to Macca for Soler and JJ for Preciado. The Ramirez, Sissoko and Roa signings are thanks to the gems thread and the shortlist contained in there. It's very interesting reading. DR Borja San Emeterio (£900K compensation), Sevilla. DL Lucas Olaza (free), Danubio, no w/p. AMR Jonathan Gonzales (£700K) Leon. ST Talles (£600K) VDG, Orlando Berrio (£185K), Atletico Nacional. I'll post the further transfer activity in the next couple of days. That is a lot of transfers!! Did you sell a lot of players too? how you getting work permits for all these South Americans ? Yes I cleared out the squad. I like to build my own team and try to push the quality of the squad. They get work permits without any difficulty. The advice from Welshace explains how. It has literally transformed the game for me. I think that you can build a team that could compete in the Premiership for £20-25M. I think the part he's wondering is how you managed to get the 7-8million or so to buy those players. Assume, he'd be interested on who you sold etc. I raised £20M in sales and got 70% of it, plus cashing in the Byram clause. I was unable to sell Wood or I would have raised more. Loaned out Murphy & Roofe (complained in previous save about game time) to save on wages and adjust budget. Jesus christ, thanks for the advice on Lasagna. He is absolutely ridiculous for me. 32 games played in the first season and he has scored 36(!) and has 8 assists. We're top of the league with 4 points. Much thanks to my beloved Lasagna. blimey! Lets hope Brexit doesn't kill your strategy!! Does anyone know the date when that comes up in the news item on fm? Really good point that. I'm currently assuming that the non-EU work permit rules would still apply.. Make for an interesting game if they change. Brilliant sales there.. good to see it's still possible to do... even though, finding the quality we could in previous editions isn't quite there on this one. Thank you, I just try to work on the basis of taking the money when I can. The w/p info together with scouting in game has made things really interesting for me this year. Has anyone come across Brexit yet? I'm building my transfers for 1st season in Prem (which I think is going to be almost impossible) and don't know whether to steer towards UK players. Team started terribly then turned things around before introducing Preciado late on ready for Extra Time finished the game off. 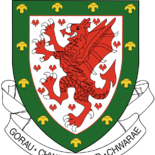 Cant wait to see who I get drawn for the semi's. And I've just drawn Newcastle in the Semis so a chance for a Final is on the cards all going well. Anyone else in prem in season 2? 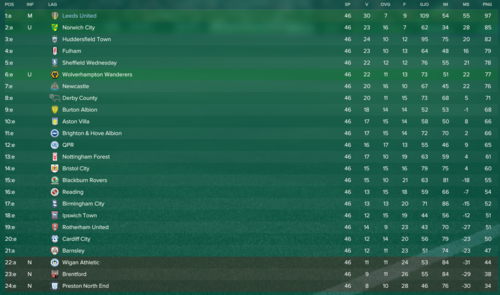 I'm 8 games in with only 9 points on the board, but I've played man u, arsenal, spurs and Liverpool within that lot. I've had to play on counter and change tactics completely in order to stop shipping so many goals. How have others approached it? I just think my team is so much poorer than the big boys I cant play more attacking. 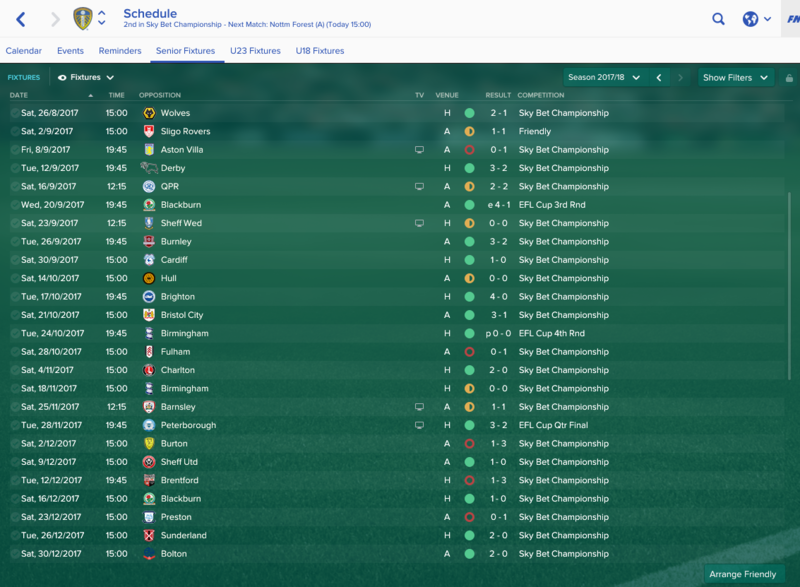 Pretty happy with the first season. Lasagna absolute beast. I've just played three games in PL so far. I went from an attacking approach to a counter-mentality. So far one loss against Man Utd. Won against Liverpool and Everton. Pretty happy at the moment. But it could change rather quickly... I feel a bit lucky. Managed to pick up Mauricio Lemos from Las Palmas as they were relegated from La Liga. 9m euro. What a steal. That looks like a great signing! Has joined Chelsea for £26 Million in my save. making my Jordan Rhodes signing looking a bit pathetic!! Ha ha. To be fair to him he is 1 in 2 so far in a poor team. It will be very interesting to see what SI have so far coded into the game for Brexit. I'm working on the basis that non-EU work permits rules will remain the same post any Brexit. The work permit sytem has operated for a number of years and has contributed to a major commercial success in the Premier League. For a variety of reasons I think Government will want this to continue, for example due to taxation revenue. I don't see this as applying to future EU work permits if a 'hard' Brexit applies however and could see the current non-EU work permit rules applying to EU players post Brexit. So, in summary, I'm going to continue to look for value in the market using the existing non-EU work permit rules. If I'm wrong then I figure I can always have another fire sale. 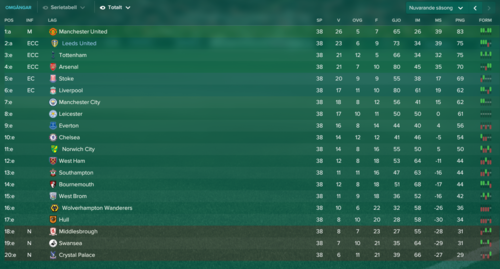 Currently Sat top of the championship midway through January of the first season, won the first leg of the Semi Finals in the EFL Cup against Newcastle 4-2 at Elland Road so hopefully as long as nothing goes majorly wrong at St James Park I should be able to book a place against Manchester United in the final (Not holding any hopes of beating them). I'd say that my midfield was probably one of the strong areas at the moment with Eunan O'Kane been a star performer and my Top scorer in the league. But when the chance to bring Cook back presents itself its something that needs to be done. anyone got any decent corner or free kick routines. Its been a while since I scored from either! wow. I played him as my sitter with Mowatt going forward. I originally planned on selling him and offered him out a number of times over the first few weeks but nobody was interested. Because he didn't sell I decided he may as well be used and hes been brilliant. Really happy he attracted no interest. Hes been playing as just a standard CM Attack no extra tactical instructions added. 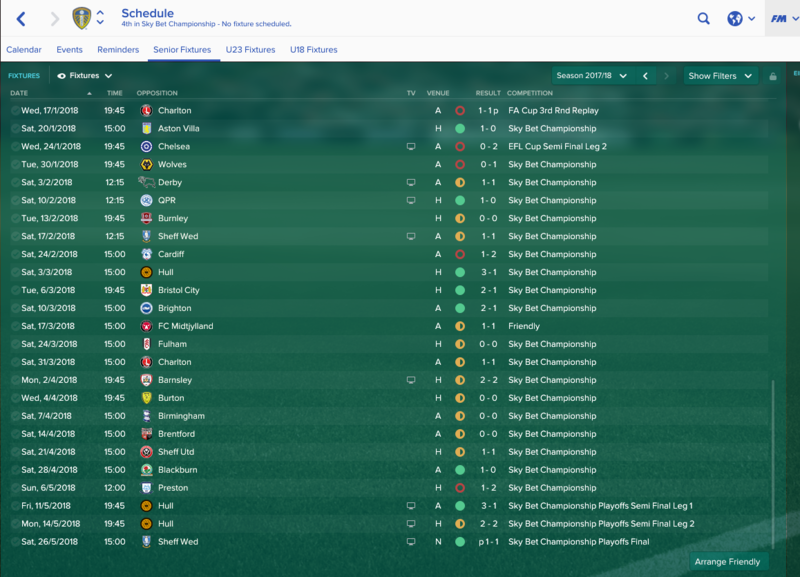 January of the second season and things are looking good. nice three way race to be involved in and just changed expactations to make the play offs. Defensively sound but for the odd freak result. Definite highlight was a 4-0 thrashing of Brighton (3rd v 5th at the time). Got through to semis of league cup without having to beat anyne from prem but got Chelsea in the semis so cant see us going to wembley. Would reccomend anyone try and get Locatelli in on loan - absolutely bossing it. on a side note, always noce to see someone from the game on the gossip pages IRL. Picked Llorente up for £450k and doing ok for me but im also trying to bring Vieira through. Picked up Jansson, Moussa Dembele (the striker at celtic) and Mauricio Lemos after my first season and to prepare for Premier League. It went, well … a lot better than I imagined. Dembele scored 26(!) in the league losing out only to Arsenals Icardi (27). The board gave me a nice transfer kitty for the upcoming CL-games. I have no clue what so ever who to buy though. Could need another striker and a right back. Perhaps a cm as well... Tips? Got about 50 m euros. It is interesting how similar our saves are. I was in exactly your spot in January year 2. I finished year 2 last night, won the EPL cup over City 2-1 and won the league by one point on the last day by beating reading who had lead the league all year. Very odd. Just an fyi I was able to grab Polencia (sp?) from Barca at RB/LB for 350K in January. Very highly rated Wonderkid who can play both sides. Once he settles in he really turns it on. Was given 21M for my first year in Premiership and they upgraded our youth ranking. Mowatt carried the team on his back the last three weeks. He was fantastic. My only transfer so far is acquiring Luke Garbutt for 2.4M hoping to improve service to my forwards. Viera is developing very nicely, I play him both as DLPD and CMS. Amazing job! What a first season in the Prem! What does your tactic & first team look like? I have completed my first season, finished comfortably on top despite a poor run of results towards the end of the campaign. We almost hit 100 goals in the league but fell just short. Antonsson finished 2nd top scorer behind Nahi Wells, with 27 league goals. Have started planning for next season already. Been handed a transfer budget of 22 million & wage budget of around 400k. Lot of loan players are going to be going back so some major surgery required on the team. GK - Green is leaving, not renewing his contract. I am signing Alex Smithies for around 3 million from QPR. Only transfer confirmed so far. DEF - have tried thrice to sign Pontus but his wage demands are crazy! Offered him up to 25k per week but still rejected. Anyone signed him? Have agreed terms with Bartley but not confirmed it yet as unsure about him. Also I see that Bellusci looks quite good, did anyone play him in the Prem? Currently going into next season my only proper defenders are Stephens, Mings, Ayling, Berardi & Bellusci so definitely need another couple of players here. MID - thinking of moving on O'Kane as I mentioned. That would leave me with Mowatt, Vieira, Bridcutt and Phillips for 3 spots. So I would need to bring in somebody here too. FWD - with all the loanees gone, I will be left with just Antonsson, Roofe, and Wood. So definitely need a couple of players here too. Lot of players crying for new contracts and want a wage increase of 3-4x like Antonsson & Wood. Madness. I have a deal happening with Batshuayi from Chelsea (he is transfer listed) - 11 million up front was the non-negotiable offer they made after I asked them to keep funding 50% of his wages. I am not sure whether to push this through or not. On the one hand, he is clearly a quality player much better than what I currently have. And would be a very high profile signing for the club. On the other hand, that will be over half my remaining budget gone and leave me with around 8 million to strengthen defence & midfield. Thoughts? Star players. Dallas with 9 goals and many POM awards, now worth 6.75m. Jansson, Cooper, Bartley, Martins, Mossa all solid in defence. I think that Stephens will be ok as well but limited opportunities so far. O'kane very good and now worth 7.75m. Also Mowatt good now worth 7.25m. Silvestre much better than I anticipated and now worth 4.9m (Green hasn't had a look in and, surprisingly, hasn't complained}. Bridcutt had injury problems as well but his biggest issue is yellow cards. 11 so far. Some may have been down to me playing him as a ball winning MC where hard tackling is built in!! I'm out of action for a few days cos I cracked my screen - not in FM rage!! Still only averaging a point per game in prem after about 15 games. Need to get to Jan and do some transfer business done. Pretty happy with what I've got. Really looking forward to seeing Dembele and Preciado, although I've turned down a couple of £20m+ offers for Preciado. Gaston Gil is a trusted option, had him a lot (as a few of us will have) in the last couple of versions and he's rock solid. Nothing of real note out, O'Kane and Bellusci both for £3.8m, so essentially they paid for Dembele, which is a decent swap in my eyes. Still a bit short, need a GK, CD and maybe a CM or AM. One I'm keeping a close eye on is Berahino, he's got no clubs interested in him at the moment and is on his month to month with west brom, If he stays being avoided by clubs I might be able to snag him so Mowatt can drop back to CM. Bambock got injured for 5 months, which is a shame as he's incredibly solid. As always, advice / thoughts welcome. I've got Gil Romero in my shortlist too Macca. I'm a couple of games away from promotion so I am looking forward to the transfer activity and I'll post it in the next day or so. I still need to do an update on the January 2017 window. One player that I did sign was Fabian Noguera (remember him?) who again gets a w/p this year. He runs his contract down at SAN in Brazil and can be picked up for a very reasonable fee. Infact if you hold your nerve (I didn't) you can get him on a free. Think Jansson but cheaper and younger. I'd forgotten about Noguera, he's gone on a short term loan elsewhere, but I'll look at him for Jan. I got Berahino, absolutely made up with that, although him and Dembele are on some decent wages, so really need them to pay off. I've got a pretty good front 3 for 1st season back, the challenge is going to be keeping the goals out. That is a very explosive front line Macca. Noguera is a bit of a monster isn't he? He looks very good yes, also tracking a lad called Alfie Mawson at Swansea. He's unhappy as wants a 1st team chance, valued at £1.2m but they want £7m for him, I'm sitting tight on him as if he kicks up a fuss and wants transfer listing he might be a bargain, much like Stephens was. Robert Green (mutual termination). He was behind Bonilla and was complaining about lack of game time and I wanted his wages off the books. Vann (£875K). Swansea showed interest..
Matty Downing (£1M). Swansea again. Lucas Olaza (loan), no w/p. Jefferson Orejuela (£3.9M). A good return on the £400k paid. Angel Mena (£3.1M). Good profit on the £575K paid for him. Mohammed Sissoko (£550K). Declining quickly and good profit on the £30k paid. Edwin Valencia (£850K). Good profit on the £80K paid. Lucas Cavallini (£975K). A good return on the £210K fee. Chris Wood (loan). Complaining about game time and it moved his wages off the books. Borja San Emeterio, DR, (£900K compensation) Sevilla. Lucas Olaza, DL, (free), Danubio. No w/p. Orlando Berrio, ST, (£185K), Atletico Nacional. Not quite Preciado, but a quality player. Thalles, ST, (£600K), VDG. Top player. Jefferson Lerma, MC, (£5M, most over 48 months), Levante. Top player. Fabian Noguera, DC, (£1.3M), SAN. Juan Pablo Nieto, MC, (£54K, not a typing error), Junior. Good player for a bargain fee. Jai Quitongo, AMR, (buy now £73K), Morton. Eughan O'Connell, DC (buy now £105K), Celtic. Gennaro De Simone, MC (buy now £15K), Napoli. As Macca and I discussed above, Noguera is a top player. Camilo Vargas, GK, (£875K), Atletico Nacional. Solid Premiership quality. Frank Fabra, DL, (£1.7M), Boca. Carlos Gruezo, DMC (£5.5M), F C Dallas. Gaston Gil Romero, MC (£3.8M), Estudiantes. Juan Ignacio Duma, AML, (free), Huachipato. Hachim Mastour, AML, (free), Milan. Top potential. Andres Ibarguen, ST, (£1,1M, Atletico Nacional. Not quite Preciado but good quality at the price. So, I spent the lot. I'd like Marcelo Meli, MC, to complete the midfield and I'm hoping that he gets transfer listed in this save. With what I'm keeping, it's a decent side for the Premier League. I did get a keeper though, £2.5m for Pau Lopez, was on loan at Spurs in the first season and was only back-up at Espanyol, but he looks much better than that. I also made a mistake that's cost me as far as Dembele is concerned, I noticed that his agent had put a £20m release clause in his contract, so when he started the season with 10 goals in 6 games his value shot up to £19m. I quickly offered him a new deal with an £80m release clause, but he's stung me for another £30k a week plus massive bonus. I fear financially I've done us no favours, but worse case I can cash Preciado in, in Jan. I also suspect at some stage someone will come knocking for Berahinos' £23m release clause but no way I can afford a new deal for him, I'm spending £620k per week at the moment. Dembele is an absolute monster, just get him if you can, at any cost. I know it's only EFL 3rd round, but Arsenal had a decent team out, he ran them absolutely ragged. Macca - looks like Dembele is really doing the biz!! Unfortunately he went to Spurs in my game. Mawson looks ok, not too great. I think there are better options like the two boys at Wolves - Iorfa & Hause. Nicko and others - how are you getting work permits?! I for the life of me cannot get one. Just had it turned down on appeal for Maximiliano Romero as well who would have been my final signing of the season. Also how is Mastour doing, I am thinking of getting him on loan with option to buy. ADJ well done on promotion! Stick with us! Currently in pre-season before our first campaign back in the Premier League after the long hiatus. Here is how I have spent most of my money. On transfers out, apart from Green retiring, I decided to not sell anyone else, as they all played a part in getting us promoted. So keeping them around and giving everyone a shot at the big time. Loanees of course have all gone back to respective clubs. Alex Smithies - comes in for 4.4 million to replace Rob Green as first choice keeper. Looks well-rounded, and quite young as well. Hopefully will be solid for us. Ben Garratt - we only had two senior keepers last year so I brought him in on compensation to be a part of the squad. Kyle Bartley - got him on the 1.6 million option after failing to bring in Pontus. He was rock solid in the Championship so let's see how he fares in Prem. Ben Gibson - 1.5 million from relegated Boro, I think his attributes are far better than the fee suggests. He can play CB and also LB when needed. Jordan Rossitter - 6 million signing from Rangers. Looks a very well-rounded player for his age with huge potential. Excited about seeing him grow at the club alongside other young midfield players like Mowatt & Vieira. Jordan Ayew - our biggest signing at 11 million from Aston Villa. 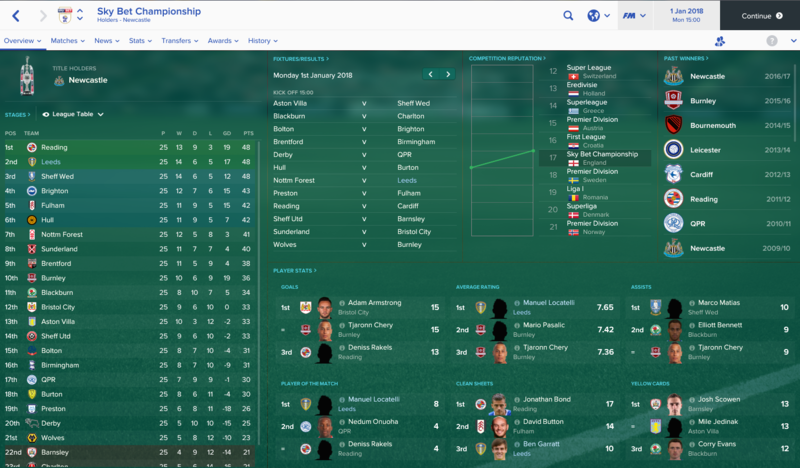 Finished 3rd top scorer in the Championship behind Wells & Antonsson. Will go straight into the first team alongside Antonsson & Roofe up front. We have 2.8 million still left, and on the look-out for one more forward player as we have just 4 for 3 spots as of now. Looking at Adam Armstrong, Zach Clough or Hachim Matsour. I really wanted to get Oliver Burke from RBL but they are not settling for less than 10 million which is impossible for us. Squad looks like this going into the Premiership season. Ha cheers mate. Completed first season at Everton before my competitors so gonna go back to this in order to let them catch up. Unbeleiveably, Leeds got relegated in that save and I had to knock them out of the cup on pens in QF!